Collins Booksellers - Accidental Intolerance by Susan C. C. Hawthorne, 9780199395811. Buy this book online. 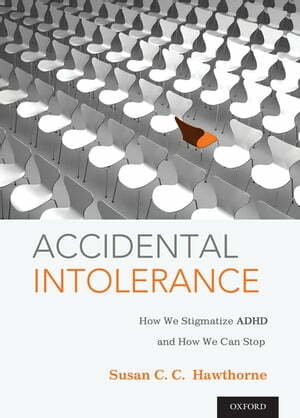 In Accidental Intolerance, Susan Hawthorne argues that in the past few decades, our medical, scientific, and social approaches to ADHD have jointly -- but unintentionally-reinforced intolerance of ADHD-- diagnosed people. We have packed social values, such as interests in efficiency and productivity, into science and medicine. In turn, scientific results and medical practice reinforce the social values, and stigmatize those considered "disordered." Overreliance on the DSM model of ADHD contributes to this process; it may also slow the growth in our knowledge of mental health. Yet many of our current practices are optional. For ethical, practical, and scientific reasons, then, Hawthorne argues that those involved with ADHD-including clinicians, scientists, educators, parents, policy-makers, and diagnosed individuals-need to examine and change the attitudes, concepts, and practices typical of today's approaches. To make this case, Hawthorne examines both standard practices and ongoing controversies in medical, scientific, and social approaches to ADHD, showing why professionals in each setting have chosen the practices and concepts they have. She then explains how the varying approaches influence one another, and how we might interrupt the pattern. Shared goals-decreasing stigmatization, providing new options for diagnosed people, and increasing knowledge-can drive the much-needed change. Adopting inclusive, responsive decision making in all areas of practice will foster it. "Susan Hawthorne offers us a multifaceted, sensitive (and sensible) study of the emergence of ADHD as a distinct diagnostic condition in the last decade or so. Carefully analyzing the research from different disciplines and orientations, as well as the reports of experience of those so diagnosed and their families, she uncovers the ways in which values and factual findings from many directions have interacted to shape this psychiatric category.